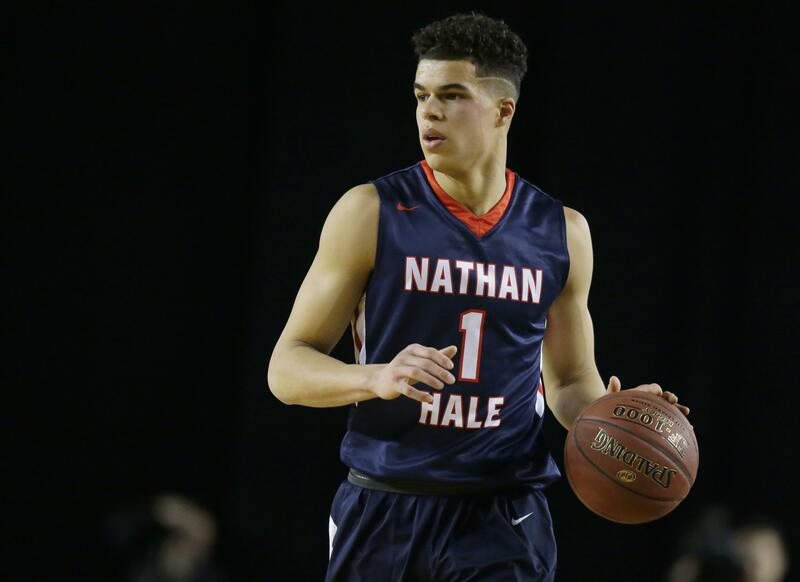 UPDATED: Thu., March 23, 2017, 4:26 p.m.
Nathan Hale’s Michael Porter Jr. , considered one of the top boys basketball recruits in the nation, said Wednesday he asked for a release from his letter of intent from the University of Washington. The decision was prompted by the firing of coach Lorenzo Romar. On Thursday morning, the school announced that it had granted Porter the requested release. The status of Porter’s father, Michael Porter Sr., one of Romar’s assistants is unknown. Romar is the younger Porter’s godfather. Porter Jr. spoke at Nathan Hale’s upper gym as part of being announced as the Gatorade national boys basketball player of the year. Porter is home schooled and was surprised Wednesday with the award at a private ceremony at his house. He was joined at the school by his mother, three younger siblings and girlfriend Madison Pettis, who starred in the 2007 movie “The Game Plan” with Dwayne “The Rock” Johnson. The Porters relocated to Seattle from Columbia, Missouri, after Porter Sr. accepted the position with Washington’s men’s basketball team. UW formally introduced Mike Hopkins as its new coach on Wednesday. Porter Jr. has long said he was committed to Romar and his father, yet was still surprised to learn this week that he is the only player of the touted incoming freshman class to not have been contacted by Hopkins. Ranked No. 2 nationally as a rescruiting class by ESPN, the players allegedly contacted were Garfield High guards Jaylen Nowell and Daejon Davis; point guard Blake Harris from Raleigh, N.C.; and forward Mamadou Diarra, a Mali native who plays for St. Louis Christian Academy in Missouri. Harris has already asked for and received a release of his NLI. Porter’s mother, Lisa, said Wednesday that her husband is close to making a decision about his coaching future. Prior to moving to Seattle, Porter Sr. was an assistant on the Missouri women’s basketball team. Porter Jr., according to USA Today, said during a conference call Wednesday that his dad has been offered a job at Missouri. Porter also said he had narrowed his options to Washington, Missouri, Virginia and Oklahoma. Porter said his list could expand once he’s been granted his release. Last week, Cuonzo Martin left California for a seven-year, $21 million contract to coach Missouri. He was introduced on Monday. Speculation has it that the son will follow his father to that school. “That’s home for me and they reached out to my dad with a job offer so if he accepts that, not saying I’ll definitely go there, but it’d be big,” Porter said in the conference call. Gatorade’s honor is the latest in a string of postseason awards for Porter. He was named the Naismith National High School Player of the Year on Monday and will play in the McDonald’s All-American game next week. Porter averaged 36.2 points, 13.6 rebounds, 5.0 assists and 2.4 blocks per game for the Raiders as they went undefeated (29-0) and won the Class 3A boys basketball state championship. He was also named The Seattle Times state player of the year. Published: March 23, 2017, 4:17 p.m. Updated: March 23, 2017, 4:26 p.m.